A rainbow lorikeet perched on our balcony, looking around to see if anyone’s home. Several lorikeets have been visiting us every day recently and they’ve been very friendly. This one posed for a photo in return for an apple slice. 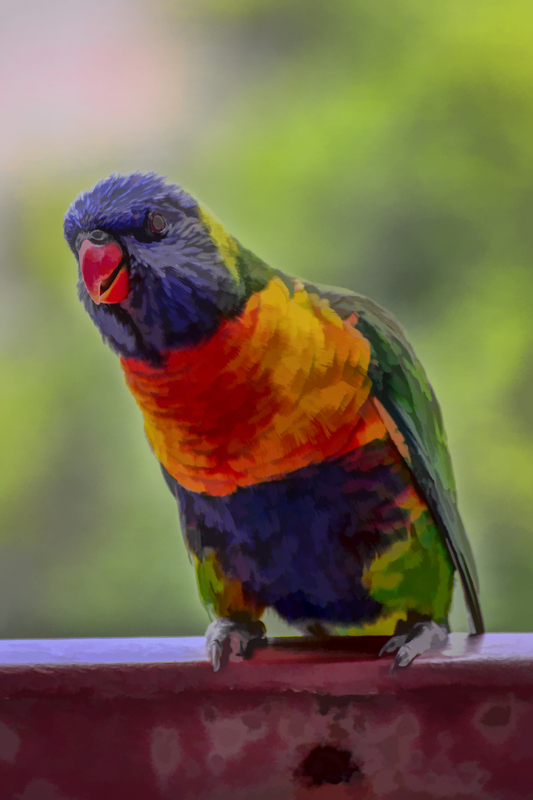 If you haven’t seen them before, rainbow lorikeets are a species of Australasian parrot most commonly found in the eastern states. They’re beautiful and very colourful but can be very loud at times and quite aggressive, particularly when defending their territory. I edited the photo to look more like a painting as I wanted to give it a bit of a different effect. The original photo is here if you want to compare them.